Over the summer I worked on helping the administrative team move first year student elective module choice online. The data had previously been collected manually via a paper form given to students. The data then had to be transferred manually by administrative staff onto an excel spreadsheet before the students were enrolled on our student record system, SITS. This was a cumbersome process usually completed at the beginning of the academic year, what was already a busy time for administrative staff. We decided to look at a quick and easy way of moving this process online. I worked with the administrators to find out the type of data they wanted to collect and how they wanted it to display in excel. I then made up a few test forms using googleform for them to check over. Once they had agreed that it would work for them I trained the administrators in how to create googleforms and how to download the data in excel format. This is a very easy process and took very little time for them to learn. We chose googleforms because it is free, all the administrators could easily get an account, the forms could be distributed via a link sent out by email or on the virtual learning environment (Moodle) and they could also be embedded in Moodle. I asked the Undergraduate Sociology programme administrator for her feedback on how the change went. How was the module choice done before moving it online? The module choice process was previously done on paper. A module choice session was organized between March and May to choose modules that would be studies the following September. Module choice handbooks and forms were distributed at this session as well as information given by tutors about their specific modules. Why did you decide to move module choice online? We decided to move the module choice online for first years (2nd and 3rd years had already chosen modules) after the idea was suggested to us by Anna Campbell. The paper forms were a bit cumbersome, so moving to the online method seemed the best thing to do. How easy/difficult do you find using googleforms for module choice? I found the process of moving to the online form very smooth, and although I may ask for a little help in setting up the forms for 2nd and 3rd years, I think that using googleforms has improved the process very much. Because the students were taken through the process during their moodle induction there were very few problems. I have not had very much feedback from them, but usually this can be interpreted as a good thing! I think I would label the categories slightly differently for the purpose of sorting, but I would not change anything on a large scale. I have worked alongside my academic colleagues Isabelle Marcoul and Svenja Erich of the Centre for Language Studies at City University London for the last two years to help develop effective online assessment. This project has now been written up for the recently published Learning at City Journal Vol 2 (2). You can download a full copy of our article here for free. I’m providing a summary of the article here, focusing on the way the technology was used and how we measured the effectiveness of a multiple choice Moodle quiz. City University London runs a programme of language modules, some for course credit, some are extra curriculum. The languages taught are French, Spanish, Mandarin, Arabic and German. Before they can join a class the students need to be assessed and assigned to the language course appropriate to their level of linguistic competence, ranging from beginner to advanced levels. In 2011 more than 1000 students took a diagnostic test. Prior to 2011, the language tests were handed out in a printed format and marked by language lecturers. The administrative burden for this was heavy with very tight marking deadlines, a lot of administrative work to assign students to the correct course, communicate this to students etc. It was concluded that an online system would help automate this, ensure the students received immediate feedback about which level and class was appropriate to them and would speed up the administrative process. The languages team wanted to assess different types of language ability while being restricted to using a multiple choice online system. Each language had a test comprising of 100 questions. Please see the article for a full description of the choice of question type and what was assessed. 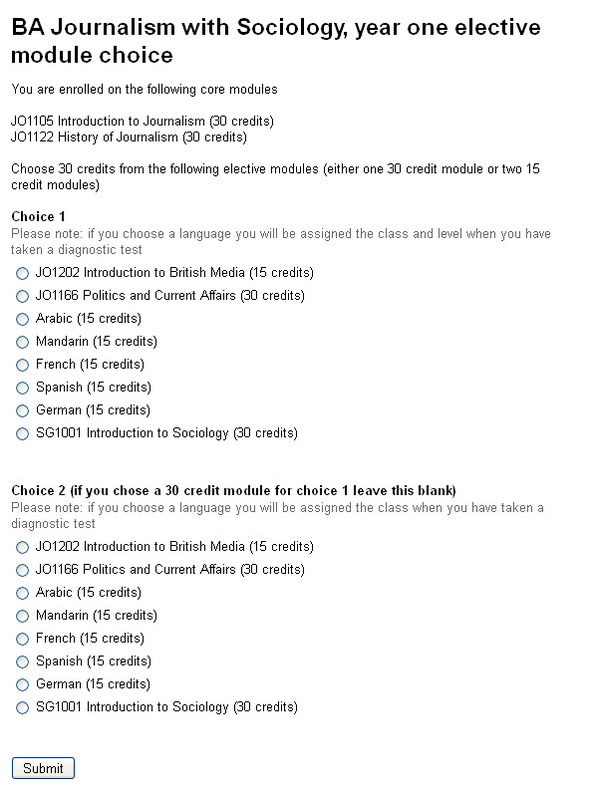 As a learning technologist I was very interested in how the languages department wrote their multiple choice questions in order to assess different types of language ability. For example, students were asked to read a generic text in the source language and were given comprehension questions to see how much they had understood. Some of the questions also asked that the students not only understand the words but also the cultural context and concept in order to get the answer right. What would you like as a main course? To answer this question students needed to demonstrate understanding of it and the choices and to pick the correct answer from their own knowledge. In the article Isabelle writes about how we construct language and how we can assess higher order thinking skills using online assessment methods so please do access the article if you are interested in this. City University London uses Moodle as it’s virtual learning environment. This was seen to be the perfect platform for the language testing. I met with the lecturers that would be preparing the questions for the test and explained how the Moodle quiz tool worked. This was to help them understand the types of question that would and would not be appropriate. Once the questions had been written we had a two hour hands-on training session where the staff were trained in using Moodle quiz and then used it to add their questions with my support. I would recommend this approach. It meant that I could immediately troubleshoot any problems and the staff involved have been successfully using Moodle quiz ever since. We also needed to collect some personal data from the students e.g. name, degree course etc. We used a googleform for this as they are very easy to set up and the data can be exported in excel format which the administrator requested. Effectiveness of the test was measured by the number of students that stayed in the group/level they were identified as during testing i.e. the language level of the course matched the language level that the student tested at. We were very pleased to see that the test proved very accurate in determining level for French, German and Spanish (small numbers of students took Mandarin and Arabic so the data was not conclusive). 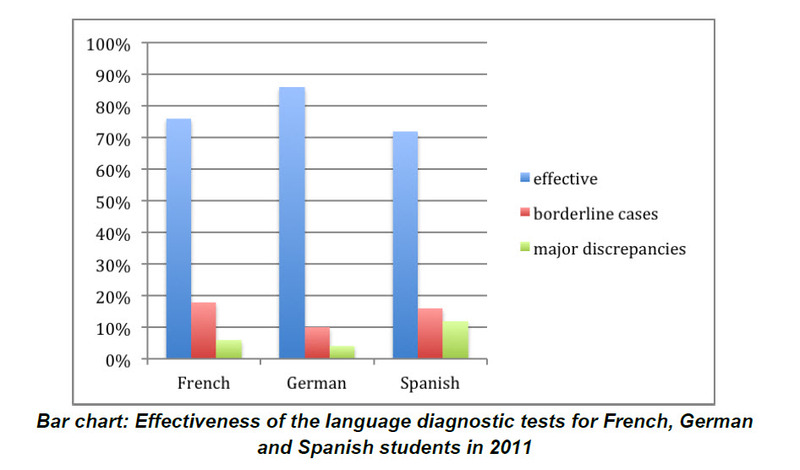 This shows that an online test can effectively measure language ability in the majority of cases with very little movement of students between levels.